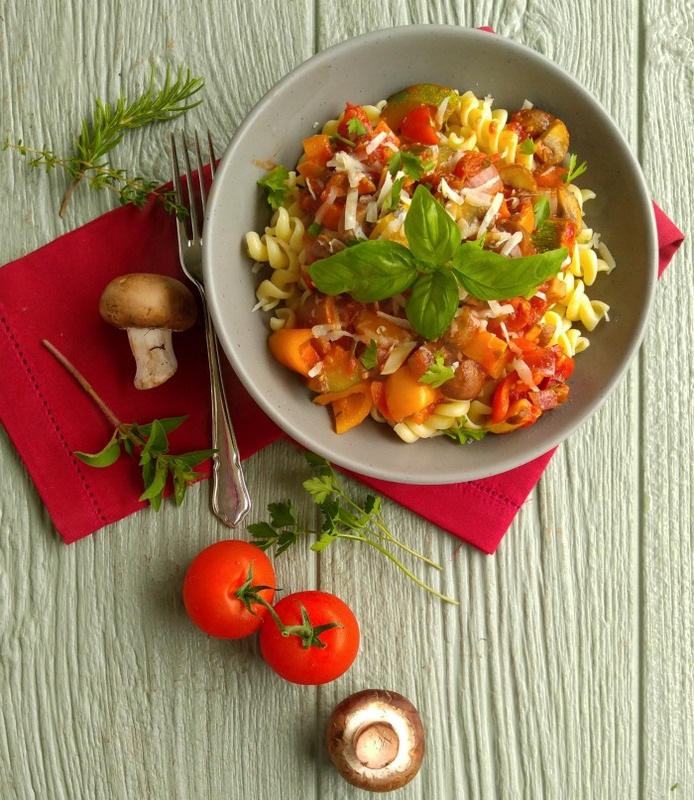 This chunky roasted tomato vegetable marinara sauce with pasta dish is the perfect meal for Meatless Monday (or any day of the week!) I enjoy eating meals that don’t have any meat in them, especially for lunches. I love to use roasted tomatoes in my sauces. Roasting them in the oven brings out the natural sweetness of tomatoes and makes the BEST tasting sauce ever! I’ve made just about every type of marinara sauce there is. Normally, I included meat, chicken or pork in my sauces, but for today’s recipe, I wanted to focus on one ingredient – fresh tomatoes. I adore tomatoes, I grow them in my garden during the hottest summer months and I purchase them in bulk year round, since I use them so often. 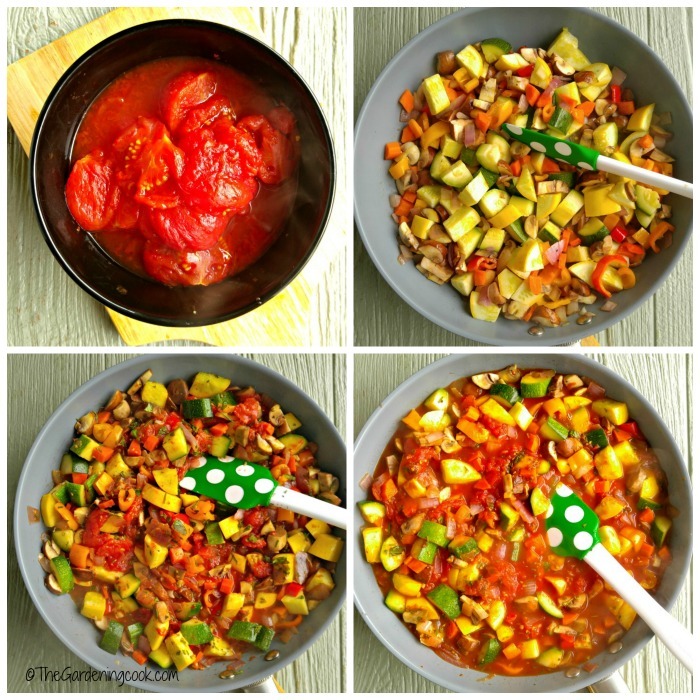 This chunky roasted tomato vegetable marinara will knock your socks off in the taste department! 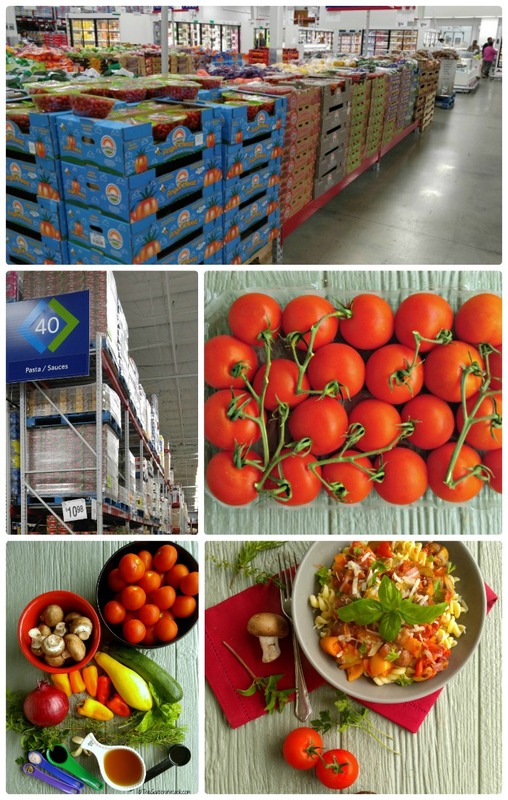 On a recent shopping trip to my local Sam’s Club, I noticed that the club had Campari tomatoes. 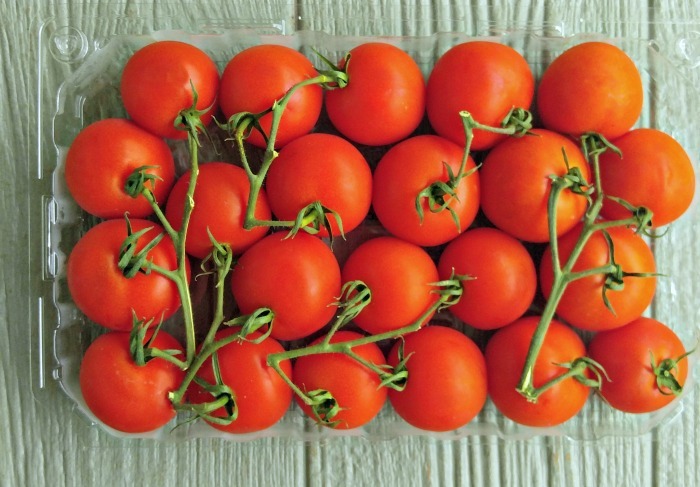 These tomatoes are noted for their juiciness, lack of acidity and bright red color. They are larger than cherry or grape tomatoes and perfect for this recipe. One way that my family tries to eat more healthily is to have a Meatless Monday meal where we focus on vegetables as the star of the meal. 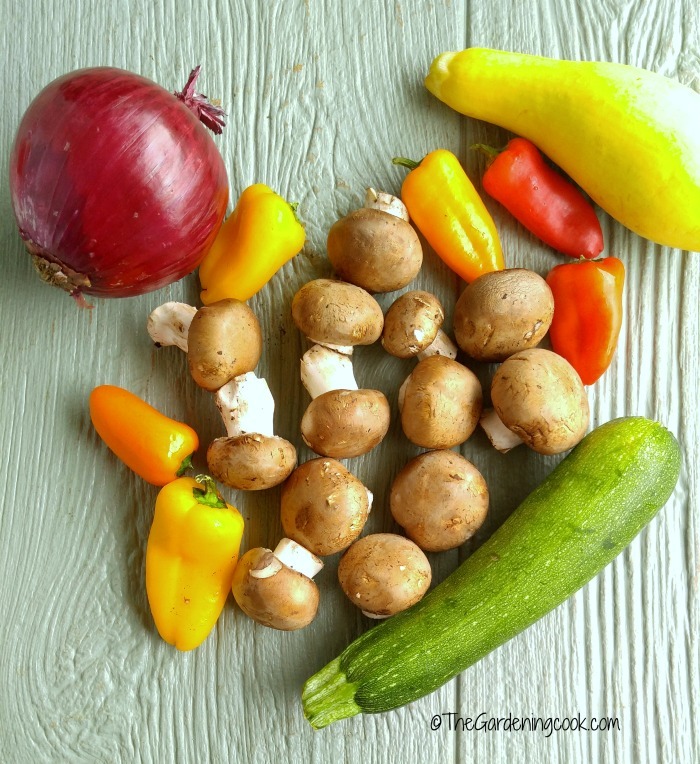 So, into my shopping cart went baby bella mushrooms, zucchinis, sweet peppers, onions and garlic – oh, and of course, those yummy tomatoes! The trick to making this delicious roasted tomato vegetable marinara sauce is to cook the tomatoes in the oven first. If you have never done this, you don’t know what you are missing. Roasting any vegetable brings out the natural sweetness of it, but roasting tomatoes, which are already sweet? OH MY YES!! And it is so easy to do. 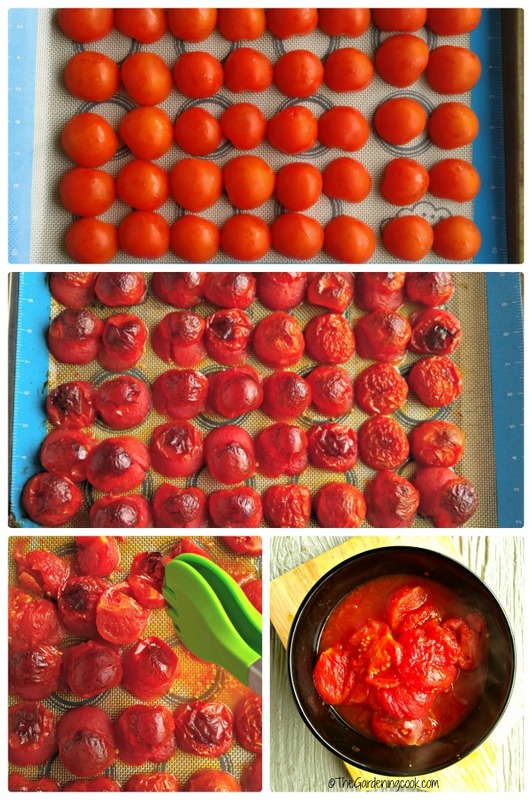 Just preheat your oven to 450º F, slice the tomatoes in half and place them on a baking sheet (covered with a silicone baking mat or parchment paper for easy clean up.) Into the oven they go for about 15 minutes. All that was left to do at the end is to use a pair of tongs to remove the skins and you will end up with a big bowl of crushed tomatoes, homemade style. While the tomatoes were roasting, it was time to chop up my veggies, herbs and garlic so everything for the sauce would be ready at the same time. This is a good way to get your children involved. The younger ones can pick the fresh herbs and the older kids can chop the vegetables. They will both take delight in knowing that they helped to make the meal. You can even start cooking the sauce while the tomatoes are roasting to save meal time prep. I just love the color of this roasted tomato vegetable marinara sauce. Look at all those luscious veggies. Those plump mushrooms will add a meaty texture for the die hard meat lovers, and I guarantee you that the flavor is so good, that they won’t miss the meat at all! Into the pan goes the freshly roasted tomatoes as well as the vegetable stock, and fresh herbs. I added a bit of tomato paste at the end to get the consistency I wanted. I used a low carb rotini pasta, so I wanted a sauce that would coat the nooks and crannies of the pasta. 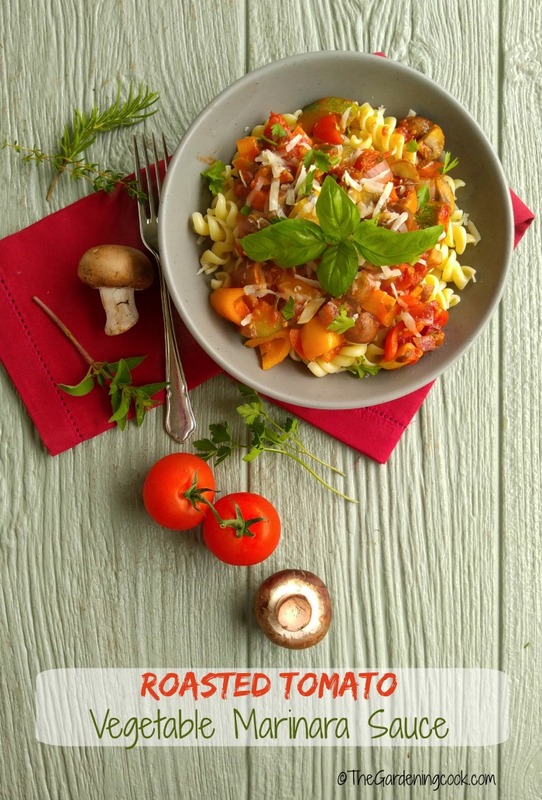 Chunky, aromatic and just pure delight is contained in every luscious bite of this amazing roasted tomato vegetable marinara sauce. It has the sweetness of the roasted tomatoes, the flavor of fresh herbs, and chunkiness of all the other veggies. A dish made in homemade pasta sauce heaven if there is such a thing. 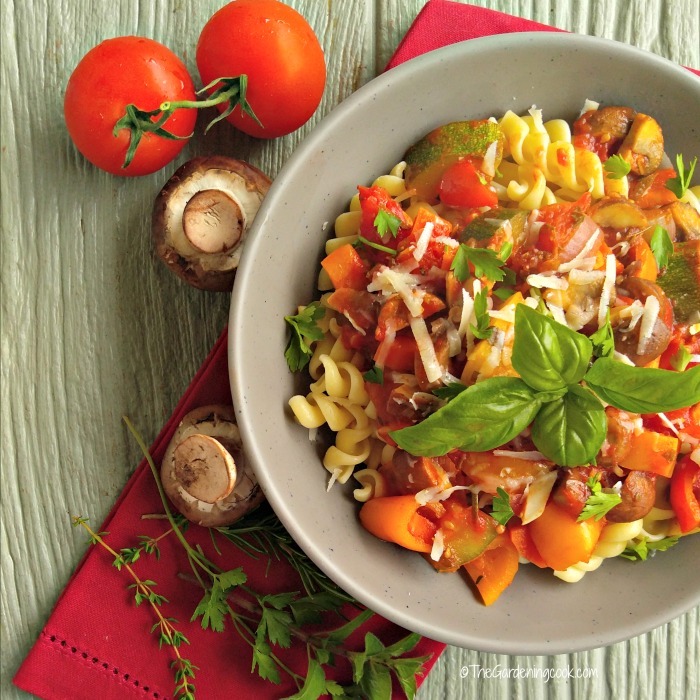 Would you like to create this roasted tomato vegetable marinara and pasta dish for your family? Head on over to your local Sam’s Club. Sam’s is a great place to get all the essentials for this meal and for many more meals prepared at home. They have a super selection of fresh product and loads of your other healthy living needs. Best of all, you can purchase in bulk for great savings. Living healthy is a big focus for me since my mother died late last year. It is great to know that Sam’s Club offers free health screenings on the second Saturday of every month. (The next one happens on 6/11/16). Be sure to check with your local Sam’s Club to see if they offer this service. Sam’s Club also offers a Healthy Living Made Simple is an online magazine that is the ultimate place for all of your health and wellness needs. The magazine is a wonderful resource for anyone who truly cares about their health and wellness. You can read the whole magazine online. And guess what? The May and June issue focuses on tomatoes as a super food! Be sure to check out the online magazine and let me know, in the comments, which article you enjoyed this month. You may find yourself as hooked on the magazine as I have become! 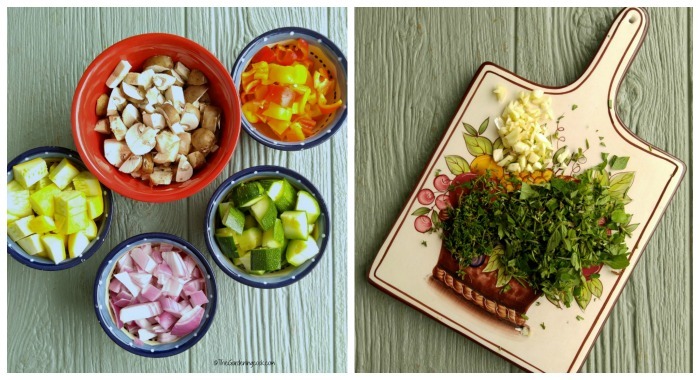 For more healthy recipes, be sure to check out my Pinterest Board. Cut the tomatoes in half and remove the stem part. Place on a baking tray that is lined with a silicone baking mat, or parchment paper and place in the preheated for 15-20 minutes until the skins start to wrinkle. Remove and set aside to cool for a few minutes, then use a pair of tongs to gently remove the skins. Place the tomatoes in a large bowl and set aside. Place the olive oil in a large non stick skillet. Sauté the onion, until it has softened. Add the peppers, diced carrots, and baby bella mushrooms and cook until they are slightly soft but still hold the shape well. Add the roasted tomatoes, salt, pepper, and fresh herbs. Stir well. Mix in the balsamic vinegar and the vegetable broth and stir to combine. Stir in the tomato paste to thicken the sauce. Simmer the sauce on low for 20 minutes, stirring occasionally.
. Bring to the boil and stir in the rotini pasta. Cook until al dente. Serve the sauce over the cooked pasta. Garnish with some grated Parmegiano Reggiano cheese and fresh chopped parsley. This looks amazing Carol! I love tomatoes but have never tried roasting them. Meatless Monday sounds great I love veggies and this dish looks so delicious and full of flavor. Thanks Linda. I try to roast when I can. It really brings out the sweetness of the tomatoes.